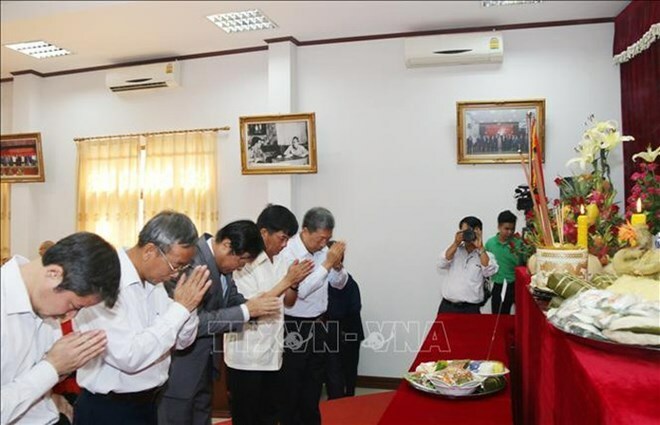 Vientiane (VNA) – A first-ever ceremony commemorating the death anniversary of Hung Kings, the legendary founders of Vietnam, took place at the headquarters of the General Association of Vietnamese in Laos on April 6. The ceremony was attended by Vietnamese Ambassador to Laos Nguyen Ba Hung, Chairman of the general association Nguyen Duy Trung, Chairman of the Vietnamese Association in Vientiane Le Van Mui, and head of the Association for Liaison with Overseas Vietnamese Nguyen Phu Binh. From the Lao side, it saw the participation of Somok Kingsada, Vice President of the Lao Front for National Construction’s Central Committee, and Bounna Phathummavong, Director of the Vientiane department of home affairs. Nearly 200 delegates from Vietnam’s representative agencies, the Vietnamese business association and overseas Vietnamese community in Laos were also present at the event. Following traditional rituals, the commemoration ceremony was chaired by head of Phat Tich Pagoda in Vientiane Venerable Thich Minh Quang, who is also head of the Vietnam Buddhist Sangha’s coordination committee for Vietnamese Buddhist cooperation in Laos. The event helps Lao people understanding more about the culture of worshipping of the Vietnamese people while strengthening the ties among the Vietnamese living in Laos. Legend has it that the Hung Kings ruled Vietnam from 2879 BC until 258 BC and they are widely considered the founders of the nation. To honour the Kings, the tenth day of the third lunar month was designated as their national commemorative anniversary date.